This book was amazing in the way that it showed the culture and customs of the Huron Native Americans, and in the way it tries to put us into the minds and time of Native America. The only reason that I don’t give it 5 stars, actually, is because the book was so intelligent sometimes as to be confusing. Also, I felt that I did not totally understand the message of this book, or the point of the title, ‘orenda’. It is explained within the book that ‘orenda‘ means spirit, but then there is another term, ‘oki’, which I think means ghost, but also seemed to mean ‘spirit’. This confused me. 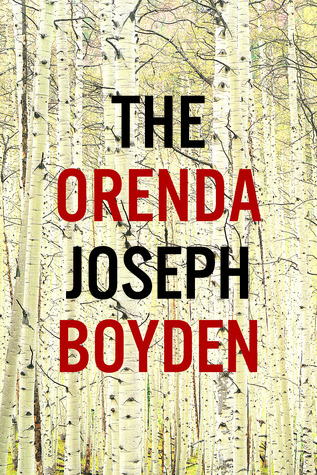 The Orenda is a book set in Native America during trades between the French and the Huron, and during war time of Huron people versus the Iroquois. In a very interesting, refreshing way, we follow the first-person point of view of 1) Bird, a Huron warrior and senior man in his tribe 2) Christophe, a French priest who was kidnapped by Iroquois and then is taken in by Bird’s tribe for observation, and 3) Snow Falls, a young Iroquois girl whose family was brutally killed by Bird and is adopted by him as his daughter. This book was very good. The language was very simple. The story was very engaging. However, I found it more engaging for the history, for the entire book. In the second half of the book, after Snow Falls is more grown up, more action happens in the book, and the characters become more emotionally engaging. In the second half of the book, the emotional engagement and action of the story picks up. The feelings in the characters are very real, from the anger Snow Falls has towards Bird for killing her family, to the pain Bird feels at having lost his, plus the confusion and hope of Cristophe and his belief in Christ, as he tries to bring the ways of Christianity to people he sees as very barbaric. The juxtaposition of the external and internal conflicts between these three characters is quite fascinating. There was never a moment where I found this book totally boring. In its ability and willingness to tackle great scenes of death, battle, and even Native American sacrificial rituals, it shone in ways that other books don’t. It took risks. It is quite the epic, terrifying, despairing tale. This book is still in my head, and I finished it days ago. Go in it for culture, though, at the start…let yourself sink slowly into it…then it picks up, and the characters start to catch your fancy more. The Orenda is by far one of the best books I have read of Native American fiction. It seems that the author researched well. We have the typical things that we see in some historical fictions of Native American fiction, things we come to expect that are stereotype – scalping, brutal battle, the tension of white vs. native relations, the culture shock of Europeans, the honor Native Americans have for animals they’ve killed, etc. What makes this book unique are the ways that is strays from what you would expect from a fiction on Native America. We see some mystical scenes from Native American culture that are described in detail, and are quite beautiful, horrific, intriguing…we see a lot of mention of the eternal living soul, and death, topics that most people today are unwilling to face. Also, there is this underlying feeling throughout the book that there are mystical things happening…things that the characters, nor the readers, can fully understand or grasp. Is it Fate? Is it God? We don’t know, but…it makes this book a very mystical experience, where you feel that you aren’t even reading a book anymore, but floating in a dream of sorts. The writing is very good and simple. Concise. It has very simple language, used skillfully. I really enjoyed how the author’s chapter titles would come to play in his chapters. For instance, “The Finger Was Mine.” That is a chapter title. Then, as you read the chapter, you wonder where those exact words will come in. This chapter title aspect gave a little fun game quality to the book. Also, his chapters are sometimes very short. Boyden says what needs to be said, and shows what needs to be shown, and then he stops. Sometimes scenes end abruptly, and one chapter does not necessarily begin where the last chapter left off. Some people might dislike this. I found it refreshing reading and crisp writing. Boyden uses his side characters well. Although the three main characters are each interesting in their own way, they would not be the same were it not for the cast of multiple side characters that Boyden has. There are enough to keep the story good, but not enough that Boyden had to have an annoying ‘character list’ at the start of his book. Do not expect an easy ending out of this one. This is no beach vacation book! I recommend this book to any and all, and especially those interested in fiction about Native America. I feel like this book was well-researched and did not try to be poetical, did not try to influence your compassion towards the Natives or the Europeans, and it did not ring of Pocahontas or Thanksgiving. It stood out as its own powerful story weaved into the history of Native America. This book was one of the best fiction books on Native America that I have read. The rival it has in my mind is one I, alas, forget the name of. It was “Daughter Sun, Sister Moon” or some such, and part of a trilogy by a woman about female Native Americans. Check out The Orenda next time you’re at your local library!